I will be honest—I was not thrilled about the idea of thinking about this book again in order to write a review. I was so bothered by the end of this series that I felt depressed about it for a week after I finished the novel. I loved Divergent. I thought that Insurgent was a pretty strong follow-up, especially considering how hard I geeked out about Divergent. But Allegiant left me cold. The faction-based society that Tris Prior once believed in has been shattered by violence and power struggles. When she and her friends are offered a chance to explore the world past the dystopian city of Chicago, she takes it. But Tris’s new reality is even more alarming than the one she left behind. New truths and lies change those she loves and how she looks at the world she grew up in and the one she lives in now. Once again, Tris deals with the complexities of human nature while facing impossible choices about courage, allegiance, sacrifice, and love. Let me preface this by saying that I think Veronica Roth is extremely talented. I will, without a doubt, read her future novels and support her as an author. She created real, wonderful, sharp characters and a plot that kept me hooked throughout the series. Tris is a great heroine, a real character with flaws, and a strong role model for young girls to admire and look up to. Tobias (Four) is strong, capable, and a solid match for Tris. The way that they go about their relationship is realistic and admirable and, importantly, a great example to follow. They love each other and struggle with being honest and hurting each other, though ultimately make the choice to keep loving each other and keep trying. 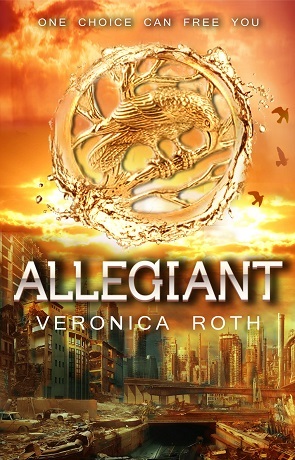 Told from a dual perspective, Allegiant follows Tris and Tobias leaving the city and discovering that the life they grew up living is actually a part of a set of experiments on genetically damaged human beings, and the world outside is very different. Divergent, as it turns out, means genetically pure. While I found this fascinating, it didn’t draw me in. The world didn’t work as well for me anymore—the flawed genetics and whole DNA spiel didn’t seem well-thought out. I felt cheated and disappointed by the plot (predictable and fairly boring) until the last hundred pages or so when it seemed to pick up. To be honest, the plot of Allegiant felt like an outline that was being followed just because it was supposed to be. It didn’t feel organic or natural, and I felt as if the novel was just a platform for rhetorical questions: is anyone doing the right thing? What does it mean to do the right thing? What is human nature? Are certain people inherently better than others? What does it mean to be a good person? What is identity and how is it important? In Divergent and most of Insurgent, these questions were there but they weren’t so on-the-surface. The deep questions that the two previous books asked were asked again, but it was as if the book was just a vessel for commentary on humanity and serious themes. A book should carry themes naturally, not yank them out of the woodwork. I was a little troubled by the changes in Tobias in the second book, and that didn’t change in Allegiant. He was moody, didn’t pay attention to the big picture, and was more likely to fly off the handle, which is not the Tobias I fell in love with in the first book. I had a hard time believing in Roth’s portrayal of him as a narrator—not to mention the fact that his voice in the novel sounded an awful lot like Tris’s voice. I would start a new chapter and quickly be confused, having to go back to see which character was speaking. Despite the confusion of the narrator voice, I loved Tris and Tobias together. It felt like they got their groove back in a lot of ways—despite the dishonesty, which is natural in a relationship. They were patient and loving, and they chose to stay and try with each other. I loved how Tris was who she was and she was not going to apologize for it, no matter if she could be a little callous. As a reader, I was never asked to make excuses for her or take excuses from her, and I loved the rawness of her character. I think my trouble with Allegiant is that, overall, I felt no closure from the end of the series. No sense of satisfaction. I feel like there is still a different end to the story that I am waiting to be told. Written on 26th May 2014 by Vanessa.